My day began rather late, actually. Daddy left for work early and I forgot to set my alarm clock. I think it was around 7:45 am when I got up. By the way, that's late for me. The rest of the house didn't wake up for a while, so I got some coffee and read a book until the others got up. I wore a matching outfit I got on sale at Goody's last summer. 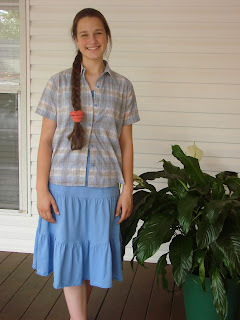 A light summer skirt and matching top, and of course in my favorite color. After having a late breakfast, Mother started cutting out fabric for culottes. 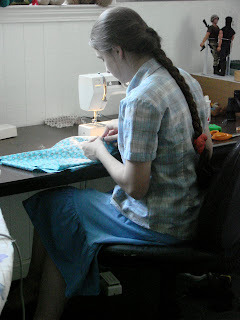 She showed me how to sew them together (quite easy!) and I got to work. It didn't take me long to mess it up and so I pulled out the seam ripper and fixed my mistake. I got my culottes done all except for hemming the legs and sewing the elastic in the waist. I started to work my sister's pair. I was doing pretty good until, yes, I messed up again. This time it took a little longer to fix. By this time, it was late afternoon and I decided to leave the sewing for awhile. I didn't get many pictures, but I'm hoping to get more on the rest of the days. I mostly sewed today, though. I'm excited about doing this for the rest of the week. Great job on your sewing! I know how mess-ups go. The stitch ripper is my best friend! ;-) I use it on pretty much everything I make. Coffee ice cream? Why ruin good homemade ice cream with that flavor? Please know that I'm joking! =) I'm glad you enjoyed it - though I probably wouldn't have. Thanks for posting the pictures and sharing about your day!!!! > I think it was around 7:45 am when I got up. By the way, that's late for me. The seam ripper is the most essential tool in my sewing kit, so of course I always misplace it and have to hunt for it far and wide. (It doesn't help that my dog loves to hide it!) I'm thinking about making a little craft apron to keep it close at hand when I sew.